What distributor should I use? The best distributor option is the Mallory Unalite, this system uses a Photo-optic LED triggering system for the most accurate and maintenance free ignition timing. There are some other alternatives though. 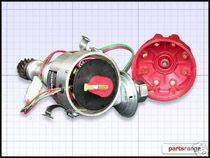 The first being a remanufactured Land Rover distributor, this uses the conventional magnetic trigger and has a standard amplifier mounted to the side of the distributor body. One main limitation of this system is the standard amplifier that only outputs approx. 60% charge time to the coil. This can be improved by upgrading to one of our RPi Power Amps which along with other functions will give you 100% output. We also offer the Mallory Dual Point system. Although many think points would be a step in the wrong direction they could not be further from the truth. Using two sets of points the load of the coil is shared and therefore the longevity of the points and service time is increased. Along with additional dwell (coil charge time) made available by the dual point system an increased spark can be obtained. Also available is our RPi Power Amp which, by replacing the original amplifier, will give 100% of your standard distributor dwell as apposed to the approx. 60% that the standard unit outputs. Our amplifier can be used on all standard Rover distributors (except the early Lucas Opus with integral amplifier). 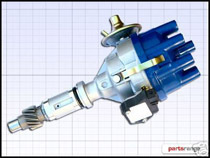 With an improved or brand new distributor in place it is imperative to upgrade other ignition areas also. With increased voltage being conducted by the ignition (HT) leads standard ones are just not up to the job. A simple upgrade to Magnecor HT leads will ensure that all that extra energy gets to your spark plugs. Plug gap should also be increased to 0.8/0.9mm with this increased spark. Mallory Unalite : Suitable for both fuel injected and carburetted engines. The distributor/oil pump drive is directly suitable for pre 1976 and (approx. post 1993) Serpentine engines. However this can be changed to the post 1976 female oil pump drive very simply, for instructions please click here. Mallory Dual Point : Suitable for carburetted engines. The distributor/oil pump drive is directly suitable for pre 1976 and (approx. post 1993) Serpentine engines. However this can be changed to the post 1976 female oil pump drive very simply, for instructions please click here. 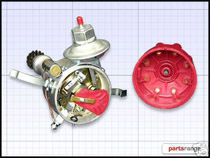 Remanufactured Land Rover distributor : Suitable for both fuel injected and carburetted engines. The distributor/oil pump drive is suitable for only the post 1976 engine. We strongly suggest upgrading its ignition output with our RPi Power Amp. 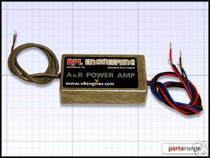 RPi Power Amp : Designed for fuel injected and carburetted engines there are two versions available. A single timing version for increased ignition output on engines just running with one fuel type, or a dual timing version designed to run two ignition timings (mainly used with LPG conversions). Suitable for all standard Rover distributors (apart from the early Lucas Opus with it's integral amplifier). Compatible with the Mallory Unalite when the dual timing function is required and also an upgrade to the Mallory Dual Point as this unit will remove the electrical load from the points.